The U.N. Security Council passed a resolution Monday giving Iran until the end of August to suspend uranium enrichment or face the threat of economic and diplomatic sanctions. Because of Russian and Chinese demands, the text is weaker than earlier drafts, which would have made the threat of sanctions immediate. The draft now essentially requires the council to hold further discussions before it considers sanctions. The draft passed by a vote of 14-1. Qatar, the only Arab nation on the council, cast the lone dissenting vote. The resolution, drafted by Britain, France and Germany with U.S. backing, is a follow-up to a July 12 agreement, by the foreign ministers of those four countries, plus Russia and China, to refer Tehran to the Security Council for not responding to incentives offered in June to suspend enrichment. "If you remember the reason for that resolution is to make the suspension of enrichment and related activities mandatory and then to give Iran a deadline by which it should accept the now mandatory requirement that it suspend its enrichment activities," Secretary of State Condoleezza Rice told reporters on a flight from Jerusalem. 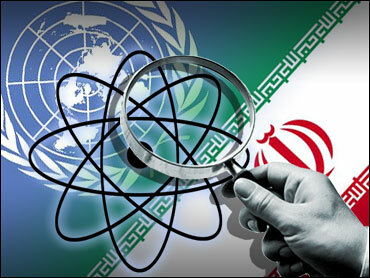 The resolution calls on the U.N nuclear watchdog, the Vienna-based International Atomic Energy Agency, to report back by Aug. 31 on Iran's compliance with the resolution's demands. If Iran does not comply, the council would move to adopt political and economic sanctions, the resolution said. "The Security Council vote on Iran was a clear message to Tehran that it will be hauled before the international organization and that the world powers – including Russia and China – can speak with a unified voice, when it comes to Iran's nuclear program," said CBS News foreign affairs analyst Pamela Falk. The ministers asked that council members adopt a resolution making Iran's suspension of enrichment activities mandatory. Qatar's U.N. Ambassador Nassir Al-Nasser said that while the demands of the six nations were legitimate, the resolution will only exacerbate tensions in the region and Iran should be given more time to respond. Tehran said last week it would reply Aug. 22 to the Western incentive package, but the council decided to go ahead with a resolution and not wait for Iran's response. "We do not agree with the tabling of this resolution at a time when our region is in flames," Al-Nasser said. "We see no harm in waiting for a few days to exhaust all possible means and in order to identify the real intentions of Iran." Last Friday, Iran called again for international negotiations on its nuclear ambitions and said it was considering the incentives. Western nations have dismissed the idea of such talks without a halt to Iran's uranium enrichment. An Iranian state radio commentary said Saturday that Tehran would reject the proposed U.N. resolution. "Iranians will not accept unfair decisions, even in the framework of resolutions by the international bodies," the state-run radio said. "Ultimatum and deadline cannot be acceptable to us," the commentary said, accusing the United States and its allies of making what it called an illegal demand. "Iran's response - that the U.N. does not have legal authority to act - is a repeat of Iran's position all along, and that is that Iran wants to keep the docket on its nuclear program at the International Atomic Energy Agency instead of in public view at the Security Council," Falk said. Tehran said last week it would reply Aug. 22 to a Western incentive package, but the council decided to go ahead with a resolution and not wait for Iran's response. The U.S. and some of its allies accuse Iran of seeking to produce highly enriched uranium and plutonium for nuclear weapons. Tehran maintains its nuclear program is purely peaceful and aimed at generating electricity.